Excavations led by the early 20th-century Norwegian archaeologist Haakon Sheteligem and his Swedish colleague Gabriel Gustafson in the burial mound at the Norwegian Oseberg Viking ship hull revealed from the 9th century. The vessel type "Karve" typical clinker hull are mutually offset PLANK was made mostly of oak; bow and stern were decorated with magnificent carved belts. The boat was later salvaged and restored - you can visit the Museum of the Viking ship at Bygd_y near Oslo, Norway. In the same city is located i Kon-Tiki Museum, with collections from expeditions Thor Heyrdahla, Norwegian Maritime Museum and the Fram Museum famous polar expeditions of Fridtjof Nansen and Roald Amundsen - it's worth a trip to the north! The initial exploration of the ship sinking and dual built replicas seemed to prove that it was more a vessel intended for ceremonial burial significant Viking "Officer" - in this case, apparently Queen Asa, buried in 834 - not a ship capable of sailing on the high seas. Using the most advanced non-destructive research methods, such as laser scanning, but in the last decade led to the discovery that when lifting the hull and then the restaurant has been shortened torso, thereby mast got into the wrong position and there was an undesirable change in the geometry of the hull. Based on these findings it was built in 2012 and the water started new replica. Navigational test was a complete success, the ship performed well even in the open sea and under sail reaching 10 knots. Oseberg is designed for advanced boat builders; It is designed as a non-floating table mockup. Oseberg hull has a classic wooden structure made of laser-carved parts of the hull planking and deck. 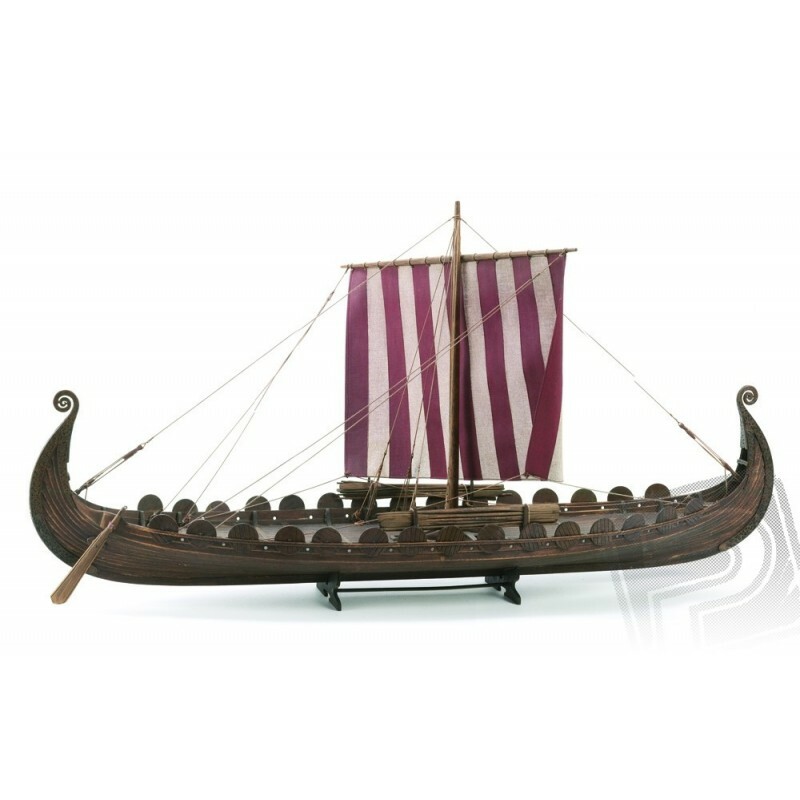 Kit includes all wooden, plastic and metal parts needed to complete the model, dummy accessories, sail etc.